We all love to go to parties with progressive, underground line-ups. We like to go there and concentrate on enjoying the complexities and tiny details in the songs put through the speakers, while maybe nipping on a drink or two on the side.. Who are we kidding again? Most of us enjoy pretending to be real music connoisseurs, but what we really love is crazy, wild, drunken partying. We don’t even remember the music the next day. The people behind Buitenspelen understand this and have set-up what promises to be the wildest and weirdest festival of the season. Oh yeah, and their line-up is awesome too. You didn’t expect that right?! We have three stages providing a mix of house, techno, electro and disco music. International stars such as Edu Imbernon, Rahaan and Guillaume & the Coutu Dumonts provide some very credible international spice, but the power of this line-up is in the very well selected harvest of local talent. Big, famous names such as Boris Werner, San Proper and Antal. Established local heroes such as Beesmunt Soundsystem, David Labeij and Cinnaman. And talents making it big such as Tom Ruijg and William Kouam Djoko. It’s party time. BUT! Back to heart of this festival: the rest of the entertainment. A big group of very creative artists was challenged to create a playground for adult. Expect to be running around and playing like a five year old without feeling awkward at all. Expect loads of toys, crazy acts, a magic show and more surprises every time you turn around. I could tell you more, but that would spoil it all.. 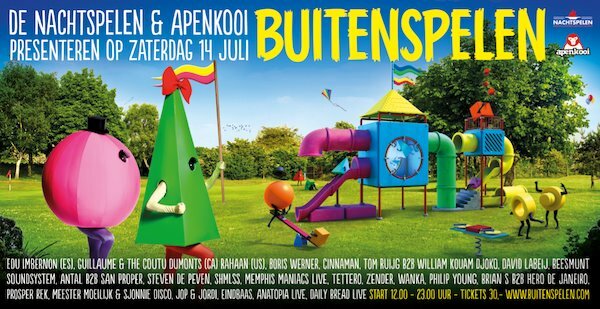 Win two tickets for Buitenspelen: comment below this post on our Facebook page with your favourite playground toy from back in the day!